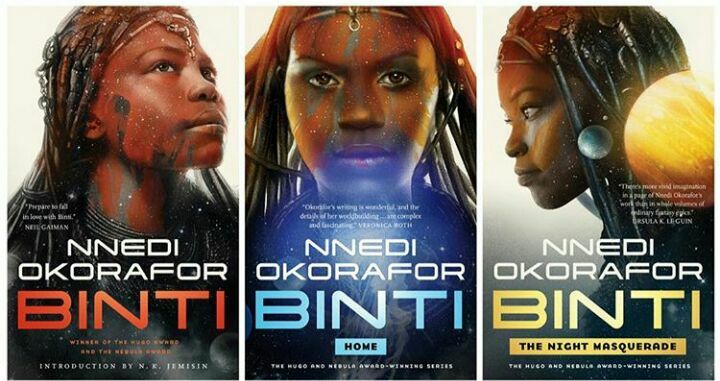 The hardcover editions of Nnedi Okorafor’s Binti trilogy books with new covers as set to be unveiled in July 2018. In 2015, Nnedi Okorafor unveiled Binti, the story of a Himba girl who leaves her people to seek her place among the stars at the finest institution of higher learning in the galaxy. That book went on to win the Hugo and Nebula Awards for Best Novella. Since then, there have been a sequel in 2017 called Binti: Home followed in 2018 by Binti: The Night Masquerade rounding off the trilogy. You can read more about the forthcoming hardcover editions here. They will be coming out in July 2018. Previous Previous post: “The Secret Lives of Baba Segi’s Lives” is back on stage. Next Next post: Commonwealth Short Story Prize 2018 shortlist announced.